In addition to the humbucker, the trusty single-coil pickup is one of the two pickup kings, and arrived on the scene as the first of the popular pickups. Since their introduction in the 1930s, single-coil pickups have been a permanent fixture on a huge range of guitars, and utilized in all genres of music, although are more often found on traditional Telecaster and Stratocaster style guitars, in all positions (bridge, middle and neck). Whether you’re upgrading stock pickups on an affordable guitar, or just fancy a bit more power and tone than your existing single-coils can offer, we’ve put together a brief chart highlighting seven popular single-coil pickups across a range of prices. Then stick around for a short guide to single-coil pickups, giving you everything you need to know to make an informed decision. Inspired by Hendrix’s 1967 appearance at the Monterey Pop Festival. A high-output bridge single-coil built specially for Jerry Donahue. An affordable neck pickup with extra fat! An innovative high-output single-coil offering the early Fender tone. A super-hot single-coil that beefs up any sound. A delightfully twangy Tele neck single-coil with Strat and Tele tones. A trio of single-coils from Fender, delivering that classic Strat tone. The 1967 Monterey Pop Festival saw the appearance of Jimi Hendrix, and the world saw (and heard!) the Stratocaster in a new light. DiMarzio have created the DP419 Area 67 as a tribute to the single-coil pickup sounds of the Summer of Love – tight, bright and clean. And they succeed. This affordable modern single-coil is very natural and crisp in sound, with an emphasis on the treble. However, unlike the originals, DiMarzio have designed this to be silent when it comes to background hum – and they deliver. Perfect for the middle or neck positions. It’s very simple in looks, with no branding, just a simple white or black plastic cover. Just make sure to remove these pickups before you set your guitar on fire! Built for Tele virtuoso Jerry Donahue, who wanted a pickup that replicated the sound of his prized ’52 Telecaster on all his touring guitars. You may not have a ’52 Tele, but if you’re looking for a single-coil to add some blistering vintage lead tones to your current model, this APTL-3JD from Seymour Duncan is a good place to start. Built for the bridge, this single-coil delivers a warm but balanced tone that’s perfect for everything from country to classic rock, whatever the gain settings. Using Alnico II rod magnets, as well as a special coil wind, the APTL-3JD offers high output, lengthy sustain, and clarity, as well as a very good bass response when compared to stock pickups. Just like a big, greasy cheeseburger, this STR-3 Quarter Pound pickup from Seymour Duncan is full of fat – although thankfully it’s the good fat tones that rhythm guitarists love. The STR-3 is the brand’s highest output Telecaster single-coil for neck position, and delivers huge tone for rhythm playing, although works just as nicely for lead, with a focused and well-rounded high-end. 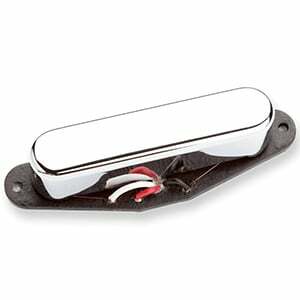 This affordable neck pickup features an Alnico V magnet, which is overwound, leading to powerful but articulate chords, which sound excellent with overdrive, and work as well for classic rock and blues as it does the heavier stuff. It looks clean and non-intrusive, with a simple polished chrome-plated brass cover. Finally, while this single-coil isn’t hum-cancelling, it is wax-potted, to keep it squeal-free. Having been used by Fender until the mid-nineties, this Lace Sensor-Red single-coil does a great job of replicating that early Fender tone, as well as giving a fat humbucker tone for heavier music styles. The Red (which isn’t actually red) is the highest output of Lace’s Sensor line and is crammed with innovation, including a unique radiant Field Barrier system and patented Lace Micro Combs. This all combines to deliver a wide tonal range, with very clean trebles and a meaty low-end – all the while keeping background noise silent. Excels when played with high gain. Overall, it’s perfect for rock and metal, when a traditional single-coil falters. Helpfully, these pickups come with a mini data CD including the latest wiring diagrams in color. If you fancy a little classic Strat tone on your modified Tele, or just want a beefier upgrade from stock single-coils in the neck or bridge position, Seymour Duncan’s STK-S2 Hot Stack is a smart choice. Under the vinyl casing – which is available in both black and white – sits a strong ceramic magnet surrounded by two stack coils. However, instead of traditional rod magnets, this single-coil used a blade, which results in a more even balance across the strings, with no drop-outs when bending. It’s a powerful pickup, and excellent both clean and dirty, staying clear whatever your drive. Another move away from the traditional is the lack of single-coil hum – this is one quiet pickup (in a good sense!). The DP172 Twang King certainly lives up to its name, offering bag loads of the vintage twang you’d want from a Telecaster, with plenty of brightness to replicate some familiar Strat tones too. Covered in chrome, the under-hood features of this cool neck pickup include controlled-tension windings, hand-calibrated magnets, special wire, and double wax-potting. All great quality for the affordable price. This all combines to deliver real fat, bluesy sound with none of the muddiness or squeal you’d find in cheaper pickups. It’s also very easy to install, with instructions included, although be warned that this pickup will not fit in anything other than a Tele, unless you’re willing to start making modifications to the pickguard. If you want an affordable way to add the ‘60s vibe to your Strat, Fender’s Tex-Mex Strat Pickups will go a long way to helping you achieve that. The three single-coil pickups included in this pack show off a familiar, simple style, with the aged-white vinyl covers offering a vintage feel that fit well on any Strat. Under the covers sit Alnico V magnets wrapped with Formvar wire, while the bridge pickup is overwound for an even bigger output. This all combines for a bright, balanced and focused tone that is Strat through and through. They sound beautiful clean, as they do with a little Texas crunch. Everything you need for installing this trio is included and, considering you get three pickups, this set shows good value. The majority of guitarists will happily play for decades without questioning how their pickups make their favorite guitars sing. But, to satisfy the more curious players among us, let’s take a very quick look at what makes a single-coil pickup. The single-coil pickup is actually incredibly simple in its construction, although the exact build will change from pickup to pickup, brand to brand. For simplicity’s sake, let’s take a look at a classic Strat single-coil – a pickup that is highly respected for its sonic properties. 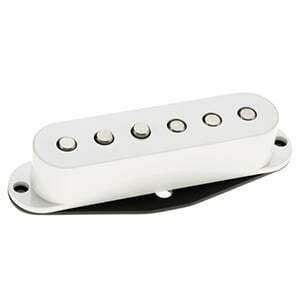 The Strat pickup consists of a set of magnetic poles/slugs, wrapped in a hair-thin wire, sandwiched between two ‘flats’ (a baseplate and a top plate). And that’s it. These are then usually protected with vinyl, brass or chrome covers, with designs differing depending on brand and type. Not all single-coil pickups are identical in size – for example, a Telecaster bridge pickup is bigger than a Telecaster neck pickup and a Strat pickup. There’s no exact formula, but that’s what makes each one sound different. While tonewoods, EQ controls, pedals, amps, and – ultimately – the player will all play their part in the guitar’s overall sound, a single-coil typically has a tone described as bright, sparkly, jangly, crisp, clear, and – when played with overdrive – beautifully gritty. You can also get awesome twang from a single-coil, which is why they are favored by guitarists playing surf, pop, country and vintage tunes, although they have been utilized by hard and classic rock players for decades. On that note, legendary players to make good use of single-coils include Jimi Hendrix, Eric Clapton, Stevie Ray Vaughan, Eric Johnson, Jeff Beck, David Gilmour, Ritchie Blackmore, Jerry Donahue, Keith Richards, and Yngwie Malmsteen – to name a few. The main drawback of a single-coil pickup is that they are prone to hum, especially as volume and distortion increases. This is part and parcel of a single-coil and something you grow to accept – unless you look towards stacked humbuckers, which are a kind of hybrid humbucker/single-coil, offering single-coil clarity with humbucker silence. The only other notable disadvantage of a single-coil is that they aren’t as high in output when compared to their humbucking counterparts. Once again though, stacked single-coils go a long way to blurring the line between single-coil and humbucker, and compete with the latter’s output. Many guitarists will accept their guitars as they are, but changing the pickups can breathe a whole new life into your axe. Guitar manufacturers will usually look to keep costs down in the pickup area – especially when it comes to budget models. However, some affordable guitars look awesome and play wonderfully, and are excellent platforms to upgrade – which is why some players will rip out (not literally) the stock pickups and replace them with a quality brand-name single-coil pickup from the likes of DiMarzio, Seymour Duncan, EMG and Fender. Whatever your reason for buying an individual or set of single-coil pickups, we hope this short chart and guide has given you some inspiration. Of course, there are many, many more single-coils you can consider, but our chart at least offers a good taste of what’s popular at the moment. If you are going to the expense and time of changing your pickups, make sure you choose the right ones for you and your playing – read reviews, watch videos, and listen to those pickups in action, before spending your hard-earned cash. Good luck with your new single-coils! I highly respect Guitar Fella’s expertise and opinion. However, I have to respectfully disagree with your recommendation of the Fender Tex Mex for an affordable Strat pick-up. These are some of the worse sounding pick-ups I have ever heard. Instead, I wish you had recommended one of the lesser known companies that make outstanding pick-ups for a very reasonable price. Tonerider and GFS make some very fine pick-ups for around the same price as the Tex Mex and sound 100 times better. Please consider some of the smaller companies when constructing your lists.